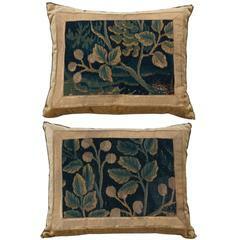 Antique Ottoman empire raised gold metallic embroidery of a bird on a branch framed with vintage gold metallic galon, criss-crossing on a mid-20th century berry velvet. Hand trimmed with vintage gold metallic soutache, knotted in the corners. Down filled. Priced individually at $600.00 each.